Hours: Mon - Sat:8:30 a.m. - 5:30 p.m.Sunday:12:00 p.m. - 5:00 p.m.
John's Sport Center will make sure you’re fully prepped for hunting and fishing seasons with the right clothing. From camo to keep you hidden while hunting to a variety of waders, as well as rain jackets, socks, gloves, and hats to keep you warm and dry, we have clothes that will perform in the outdoors. 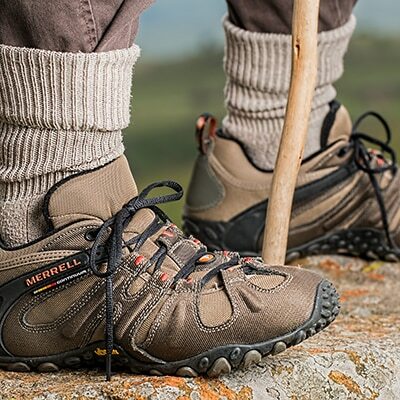 We offer all kinds of footwear including: casual, hiking, hunting, rubber, work, steel toe boots, cowboy boots and waders. We carry replacement insoles, laces, waterproofing, boot jax, repair kits for waders and boot dryers. We carry the following brands: Muck, Lacrosse, Justin, Redwing, Danner, Wolverine, Merrell, Irish setter, Frogg Togg, Spenco, Crocs and McNett for repair and maintenance. A boot is only as good and your socks! We have a huge selection for socks from kids to older adults. Kinds: hiking to running, diabetic socks, wader socks and cheap cotton bag socks. We carry the following sock brands: Smartwool, Wigwam, Ice Breaker, Feetures, Thorlo, Under Armour and Rail Road.